In Mecha Warriors you pilot your own mech, and utilize your weapons to their fullest potential as weapons are your gateway for utilizing attack cards. Weapons are attached to various parts of your mech throughout the game, and every weapon has HP which determines the amount of damage it can take before the weapon is destroyed. In this game, each Mech has a standard mecha HP of 30. If your opponent has 0 mecha HP, you win the game. You will primarily achieve this by repeatedly attacking parts of your opponent’s mech with attack cards. Attacking will always be directed towards parts, and if a weapon is attached to a part that you have attacked, it will impact damage towards your opponent’s mecha HP and weapon HP. Mecha Warriors has various game mechanics and cards types to help you become victorious in this game. 30 cards in main deck and 3 cards in starting cards section [33 cards in general excluding necessity tokens]. Field: Each side of the field is divided into 2 main zones, the mecha zone and attack zone. 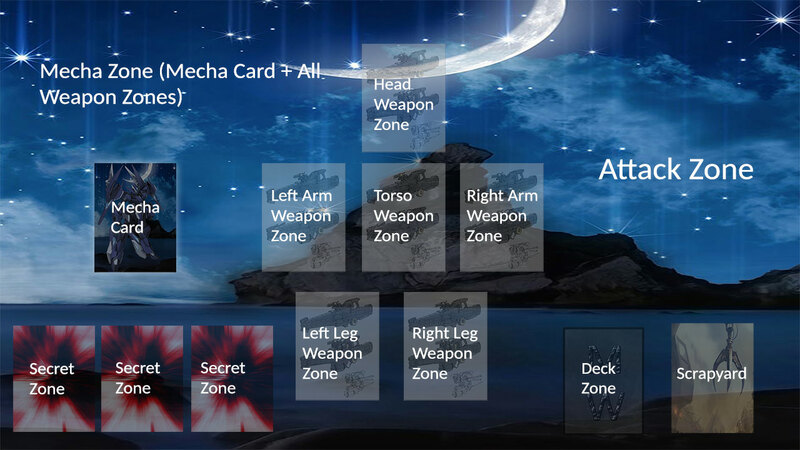 The mecha zone consist of your mecha card, all weapon zones in which weapons can be attached to and 3 secret zones. The attack zone consist of attack cards and where upgrade cards briefly go. Info: The mecha card is the main card in the overall game, and thus is limited to one per deck. Every weapon, assault attack, upgrade, and secret card is based on this card. 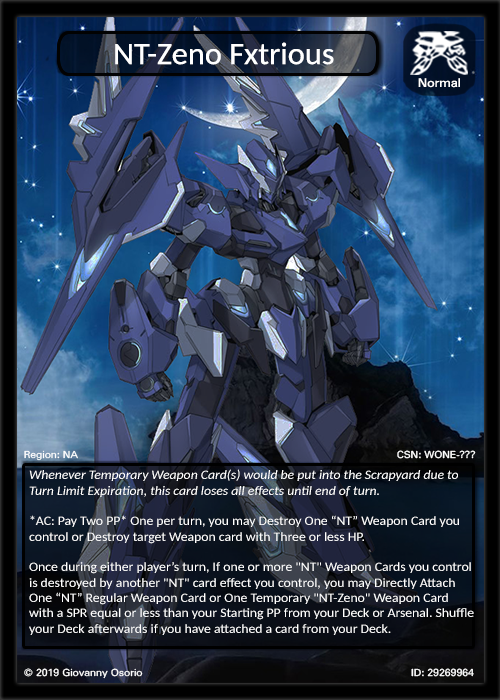 The mecha card determines the playing style of the overall deck. Normal – Normal types has no specialization, and can use several of types of effects but at a weaker state. Melee – Melee types specializes on stunning weapons and establishing on board attacks. Info: The weapon card is the main playmaker of the game. Weapon cards allows you to use attack cards which most attack cards cannot not do on their own. Regular: This weapon card type is what regular attack cards revolves around. Each deck must have 1 regular weapon card at every deck as their starting weapon. Protective: This weapon card type can protect the player from attacks and attack damage. 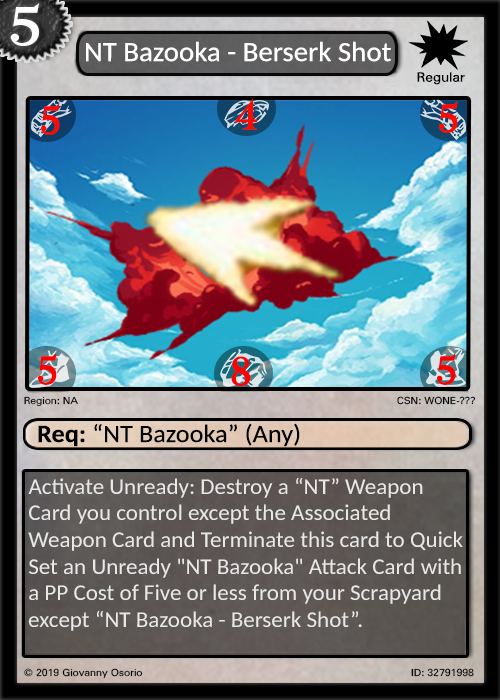 Your opponent must always direct their attacks towards the protective weapon card, as long as you have a protective card on the field. 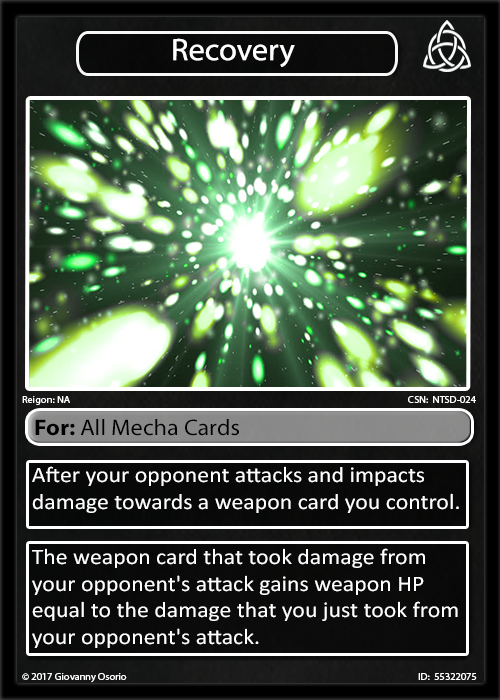 You also cannot take mecha damage from attacks directed towards your protective weapon card. YOU CAN ONLY HAVE 1 PROTECTIVE WEAPON ON YOUR MECHA ZONE AT A TIME. Temporary: Temporary weapon cards can spawn attack tokens, and only last for a certain amount of turns indicated by the turn limit. 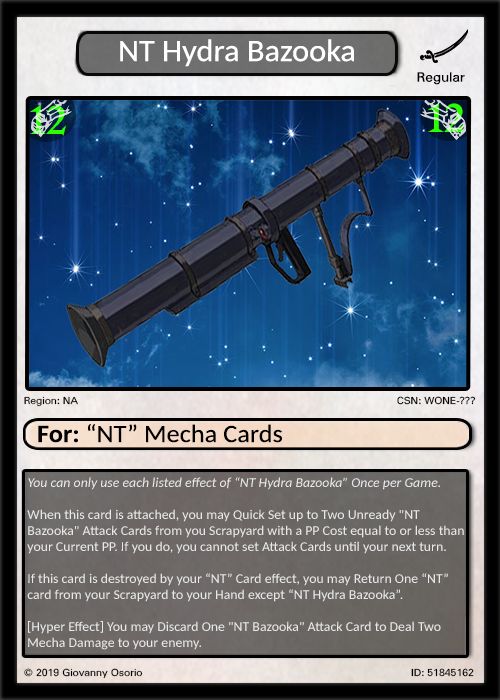 When the turn limit expires, the weapon card self-destructs. Tokens spawned to the field are automatically returned to the token pile (not sent to the junkyard) if the temporary weapon that spawned it leaves the field. 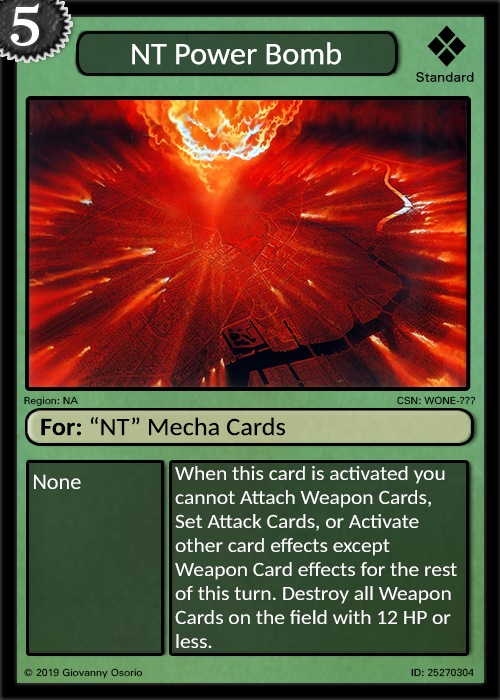 YOU CANNOT RETURN THIS TYPE TO THE HAND (except by card effect) OR ATTACH TWO COPPIES OF THE SAME CARD ONTO YOUR MECHA ZONE. Info: Attack cards is the main card that impacts damage towards your opponent. Attack cards need specific weapon cards to set them, this is listed on the card. Attack cards have their own effect, and abilities that are useful in the heat of battle. Regular: The attack card type is the most common form of dealing damage. Regular attack cards need a weapon to associate with by matching a regular weapon card’s category to a regular attack card’s WCR and matching the attack card’s WNR to the regular weapon card’s name. Regular attack cards need a weapon to associate to or it cannot be set at all. When a regular attack card is “base” set from the hand it is set in the unready position. There can be an unlimited amount of regular attack cards at a time. Assault: The assault attack card type is used for quick and easy attacks. Assault attack cards often has turn limits so they are only for a limited use. When an assault attack card is base set from the hand it is set in the ready position. There can only be 1 assault attack card on the field at a time but the one currently on the field can be replaced; however, not in the same turn it was set. Info: Upgrade cards are cards that are used to enhance your plays. Upgrade cards are recommended to give a deck extra consistency and power. Info: Secret cards are cards made to disrupt your opponent’s plays. Secret cards give a deck an extra form of protection and develop your strategies for your most desired play. Hello! I would like to take the time to read this, it is a lot to go over. Most importantly, sign up for a government copyright for your rulebook. It protects your work as you show it to new players. One word of warning, avoid tapping as it is a patented mechanic owned by Wizards/Hasbro. If you are crowdfunding, I would do special prints of the cards as you are showing though. Sure! I will give the game a look over and post any questions I have. Websites are not so bad to make anymore, try wordpress or joomla. Its been a while but Mecha Warriors Lackey Update Ver 2.3 is now available. This game as gone through another major redesign and effects have been rewritten for a easier understanding. To see what have changed since the last update i suggest visiting http://mwcardgame.blogspot.com/2018/08/mecha-warriors-23-rule-book-now.html for a detail understanding. It's been a long while since i update this post, It is important to inform anyone who downloaded this plugin in the last year that this Game's Host have been Changed and the original plugin update file wont work anymore. The reason for change of host was due to a constant freeze during the update process and it became more difficult to maintain.